And Aung San Suu Kyi is refusing to condemn the resulting bloodshed. In southeastern Bangladesh, already-crowded refugee camps are swelling each day with arrivals from Myanmar. 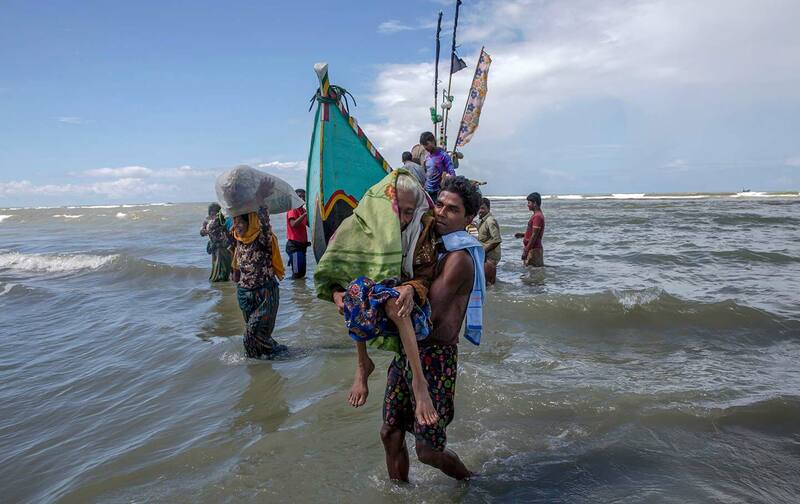 Upward of 400,000 stateless Muslim Rohingya have crossed the border in the past three weeks, fleeing a brutal military campaign launched in response to attacks by Rohingya insurgents on August 25. The Myanmar government has stated that 176 Rohingya villages have been emptied of their inhabitants, and satellite images show that more than 80 have been burned to the ground. Eyewitnesses describe indiscriminate killings of civilians. But international alarm doesn’t end at the bloody accounts emerging from western Myanmar. Instead, it has extended into the country’s center, where the government of Nobel Peace Prize–winner Aung San Suu Kyi sits. Despite reports that the military’s response to insurgent attacks has not distinguished between civilian and militant and despite the imploring of her fellow Nobel laureates, Suu Kyi’s office refuses to criticize the military. Likewise, few inside the country, subjected for so long to the military’s oppressive rule, appear to see anything wrong in the actions of soldiers. Multiple interweaving factors have conspired to create this picture. Suu Kyi may be at the helm of a civilian government, but only because her party acquiesced in a delicate power-sharing deal with the military. This greatly limits her authority, both over that institution and over decisions that affect its interests. While a chorus of voices argue that her silence is tantamount to complicity in ethnic cleansing, Suu Kyi’s inaction may not necessarily indicate support for the military; rather, she knows that any attempt to rein it in will be read by the generals as a bid for control of their defense portfolio, thereby stripping them of a key and long-held point of leverage in national affairs. This is political pragmatism of the coldest kind. Understanding the game Suu Kyi is playing—not just with the military, but also with her vast support base—helps to illuminate just how diametrically opposed the qualities that drive her international reputation and her domestic reputation are on this issue. Outside the country, many indeed consider her stance a moral failure, but that’s because the international community sees the Rohingya as victims. Inside the country, the narrative is wholly different. State-run media have repeatedly published dehumanizing propaganda. Only last year, the Global New Light of Myanmar newspaper, which often acts as a government mouthpiece, alluded to the Rohingya as “human fleas” that “we greatly loathe for their stench and for sucking our blood.” The majority of people in Myanmar appear to see the Rohingya as crusading Islamizers bent on dislodging Buddhism from its central position in society. This, therefore, makes them a greater menace to the young democracy than an invigorated military. The nascent insurgency has only fueled this sentiment and given floating anxieties about the intentions of the Rohingya a more concrete form. Within the country the public discourse surrounding the Rohingya is largely driven by a powerful xenophobic Buddhist nationalist lobby that believes human rights should be conferred selectively. In their view, political leaders who push for universal rights do so at the risk of jeopardizing the rights of Buddhists. As in ethnically fissured societies the world over, the fear in Myanmar is that to enfranchise one group would imperil the security of all other communities. Thus, while Western governments demand that Suu Kyi speaks out, she may quietly reason that to do so would inflame public opinion and imperil her political power. Suu Kyi’s apparent transformation in character may have surprised many of her long-time supporters abroad, but there is something else to remember: Never had the decades-long suffering of the Rohingya featured on the radar of the pro-democracy movement in Myanmar, and never were they incorporated into the narrative of the wider struggle of persecuted minorities. In that sense, while the denunciation of her apparent break in principles is warranted, there is also a continuity in her unwillingness to speak up that shines an unflattering light back on the history of the pro-democracy movement. This silence raises a final, uncomfortable question that both Suu Kyi, and her supporters in the West, will need to address: What vision does Myanmar’s de facto leader have for the society she is trying to help mold? In the most generous scenario, she’s playing the long game, waiting until her power is consolidated to a point that allows her to really challenge the military. But, even then, what will happen in the meantime? In failing to counter both the military and an exclusionary ideology that is growing increasingly venomous, she is enabling a culture where violence is considered acceptable in determining who does and does not belong in a changing society. Myanmar has proven to be among the most compelling recent experiments in democratization. But it has also produced that most pernicious, and hauntingly familiar, of democratic outcomes: a majority who see their neighbors as a threat to a country they claim for themselves. The military deftly and repeatedly raised the fear that Myanmar’s national identity would one day be unmoored from its Buddhist core. This has perhaps been the most significant achievement of its xenophobic nationalist project, because it has induced a sense of vulnerability that continues to rally people around a single, unifying, yet deadly, cause. Francis WadeFrancis Wade is a journalist and author of Myanmar’s Enemy Within: Buddhist Violence And The Making Of A Muslim Other.